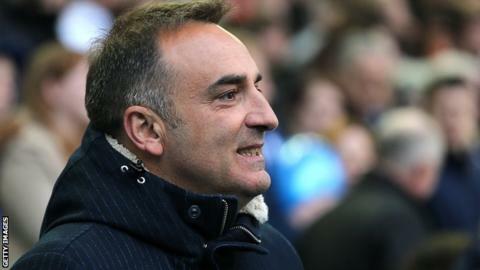 Sheffield Wednesday head coach Carlos Carvalhal believes his team's emphasis on "positive football" has been the key to their success this season. This weekend's Championship play-off final against Hull will be Wednesday's first trip to Wembley since 1993. Carvalhal signed a new three-year contract with the Owls ahead of the game. "I enjoy the fans, my players, and we develop the players so we play positive football," he told BBC Radio Sheffield. He added: "I remember after the game at Bristol City when we lost 4-1 and the fans saluted us with big applause. "That means the fans are with us and we appreciate that and we will play to them on Saturday. The people are enjoying our philosophy, so I think that's enough for me." Carvalhal became Wednesday's first foreign boss when he was appointed in June 2015 after Wednesday had finished 13th in the Championship. Under the Portuguese manager, the Owls have made 18 signings in 11 months, including Fernando Forestieri, who joined in October and ended the season with 15 goals. "I'm a happy coach and I don't want to move," Carvalhal said. "I want to enjoy what I'm doing, enjoy it with the players and the fans. "We are in a good way, healthy, running a lot and fighting a lot, and with our supporters behind us I am sure that they will give Hull City a very tough game." Wednesday have not played in the Premier League since 2000, when they were relegated after finishing 19th in the table. "We must grow up in a lot of things. The team grows up very fast," Carvalhal added. "The future now is Wembley, and Hull City, and it is a strong team with a very experienced coach, very good organisation and a premier team. It will be very tough for sure."